Get in the holiday spirit with the 10 best Christmas towns in Texas! All of the decorations, lights, and even snow to feel Christmas all season long! We are rapidly floating right into the holiday season, my friends. Yes, first came Halloween, next up is Thanksgiving and then Christmas will be here shortly after! Ahhhh! How did this happen so fast? I know it is all coming so quickly, but I am quite excited! I have big, Christmas-y plans this year, how about you? Among my Christmas plans, is a goal I have set to visit as many Christmas towns that I can this year. Did you know that we have Christmas towns here in Texas? You know the kind of towns that I am talking about? The kind of towns that celebrate the holidays in the biggest ways, decking the streets in holly and lights, every tree trimmed, buildings decorated to look like gingerbread houses and the list goes on. If you are ready to visit these towns and get yourself into the holiday spirit, here is my favorite list of the best Christmas towns in Texas. Grapevine. When you ask people what their favorite town in Texas is for the holidays, Grapevine is almost always at the top of the list. They offer over 1400 holiday events within 40 days of Christmas! They even call themselves the “Christmas Capital of Texas”. You know all about Great Wolf Lodge Halloween, but they really go over the top at Christmas! 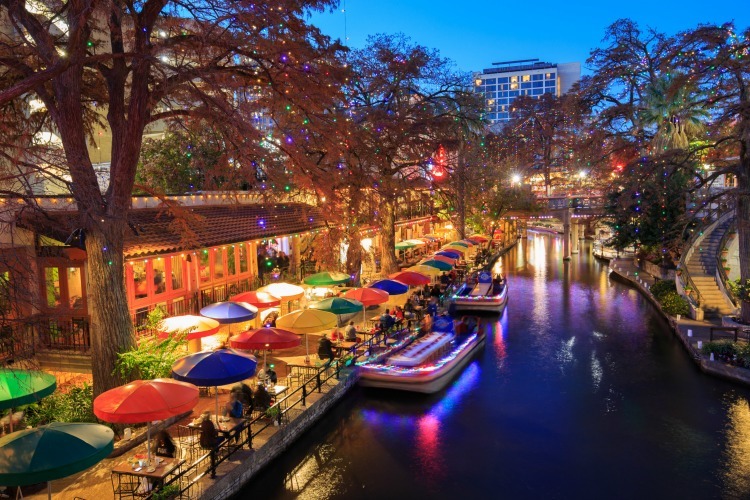 San Antonio – If we are going by the amazing light displays that a town can put on, then let’s head to the city. San Antonio is well known throughout Texas as the best place to view Christmas lights during the holiday season. Tip: Head down the River Walk and walk under the twinkling lights, or better yet, take a gondola ride powered by none other than Santa Claus himself. Marble Falls. Most people in Texas already know how beautiful Marble Falls is. During the holidays though, it turns into a true Christmas town. Here they offer a light display featuring millions of lights, holiday sculptures, Santa Clause, and more! Wimberley. Many people know of Wimberley as an outdoor recreation haven or as a popular shopping spot. 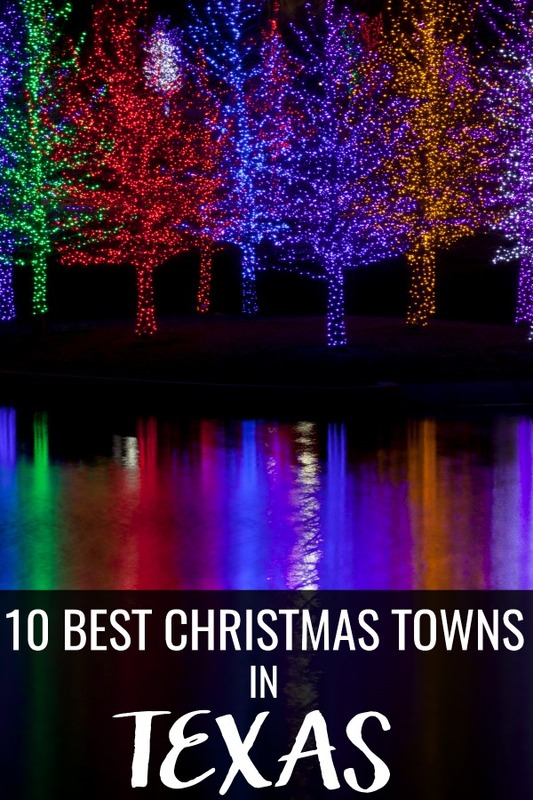 Many people, however, don’t recognize that Wimberley is one of the best Christmas towns in Texas! Here you will find the Trail of Lights that spans over eight acres and so much more Christmas fun! Jefferson. There is just something about Old World style towns that just make Christmas seem, well more like Christmas. Don’t you think? Jefferson definitely has an Old World feel to it. Many of the town’s historic properties are tastefully decorated and displayed in the town’s Candlelight Tour of Homes. Jefferson also offers a Christmas Train that runs daily until Christmas Eve, as well as a “forest” of illuminated trees and more! Marshall. Is it just me or does an outdoor ice skating rink in town really step up the Christmas vibe? Marshall offers this as well as a display of over 10 million lights, called Wonderland of Lights Extravaganza, that is open through New Year’s Eve. That means that you can enjoy this Christmas town even after Christmas! During your Christmas celebration in Marshall, you will also find a fun Christmas parade, the Jingle Bell Run, and more! Grand Prairie. Have you ever wanted to drive through a miles-long tunnel of lights? Not to worry, you can do just that in Grand Prairie. Not only that but here you will find an entire Christmas village complete with Santa and more! Cleburne. Cleburne is a super fun Christmas town in Texas! Here you will be able to see over 3 million lights, an 11 acre Christmas festival, multiple holiday parades and more! Fredericksburg. Have you ever celebrated Christmas in a German town? Fredericksburg is that town in Texas! You can see the historic Vereins Kirche building, which is stunningly decorated for the holidays. You can also enjoy the cultural celebrations, ice skate, shop for gifts and more here! Hidalgo. If you make your way to the Rio Grande Valley, you need to check out the winter wonderland that is Hildago. Hildago’s Festival of Lights is offered nightly throughout the holiday season and there are several other holiday festivals beginning on December 1st.